The Society of Women Engineers held two panel discussions Nov. 3 in which people from academia and industry shared their experiences as part of underrepresented groups in their field. At “Lives and Lessons of the Underrepresented in STEM,” the panelists encouraged students to be ambitious and persistent, and to act as role models for those who wouldn’t typically consider a career in science, engineering, technology or mathematics. The new dean of the College of Engineering, Sharon Walker, began with her own unlikely story of how she came to study environmental engineering rather than music. She opined that groups from mixed backgrounds and interests make better engineers, by coming up with unconventional solutions. The four academic panelists — like their three industry counterparts, all women — reflected this idea. It was made up of Drexel University electrical engineering professor Dagmar Niebur, middle school teacher (with a biomedical science doctorate) Karen Lancaster, Drexel electrical engineering graduate student Xinwei Zhao and Yale University environmental engineering graduate student Bridget Hegarty. Niebur explained that she had studied in Switzerland, where women did not get the federal vote until 1971, and she needed her husband’s consent to have her own bank account. She was one of a handful of woman electrical engineers in Swiss history. Nevertheless, she said she had not experienced much discrimination. “I’ve found engineers to be very rational,” she said, emphasizing that being underrepresented does not have to mean being excluded. The panel agreed that men are indeed important to expanding women’s participation in STEM fields. “I would agree that guys can be great mentors,” Hegarty, who is the founder of GradSWE at Yale, said. 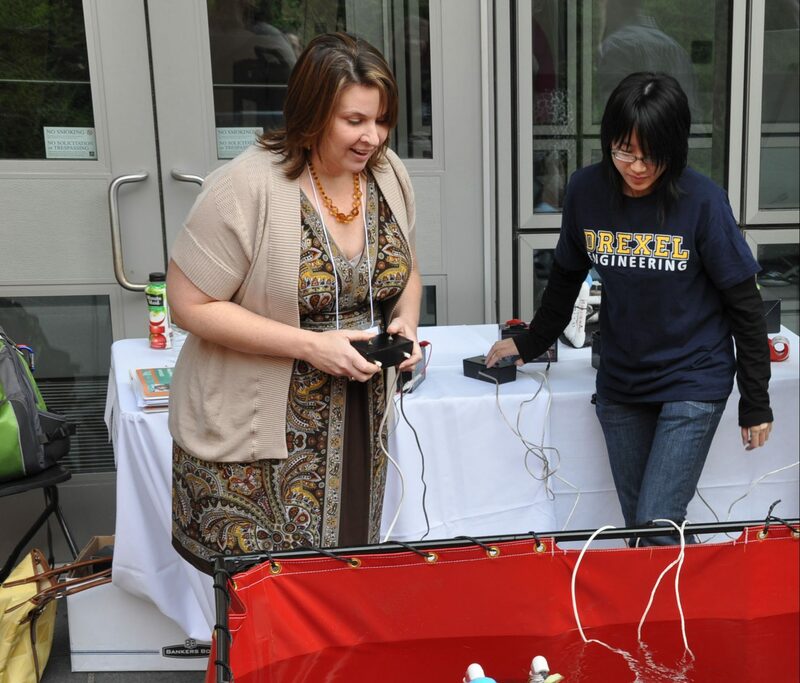 Hegarty also commended the “HeForSWE” project at Drexel, which empowers men to be advocates for women in engineering and tech. Still, each speaker had a story about a time she was disrespected and had to be confident in her own abilities. Zhao, who is originally from China, spoke about how her ease in presenting in English grew with practice, and recommended that all students take opportunities to present their work. She also relayed an embarrassing story of repeatedly damaging lab equipment, but said her mentors tended to be forgiving. Lancaster suggested that one reason there are fewer female applicants to STEM fields is that they are discouraged from a young age. Teaching at the all-girls Baldwins School in Bryn Mawr, she has found that bringing in students and professionals to speak in the classroom is very effective. She hopes the popular image of engineering will change to one of collaborative and creative problem-solving. From industry were Drexel civil engineering alumna M.P. Tumelty, staff engineer at the Pennoni firm’s transportation division; Ayanna Crear of United Technologies Aerospace Systems; and Katie Van Aken, who earned her doctorate from Drexel in 2017 and co-founded optical filter company Dragon Spectral. SWE organized the second panel to give a broader perspective of the opportunities in STEM, but also the potential difficulties in being underrepresented. This successful “Live and Lessons” was the third annual event. It was sponsored by the B.A. Rudolph Foundation. After both panels the attendees had the opportunity to speak to the panelists and develop professional connections. Though applications for the 2018-19 academic year have closed, SWE has an ongoing program that recruits alumni to mentor undergraduates.